I've got no radio reception after installing a new head unit. The blue power antenna wire from the HU appears to connect through the harness adapter to pin14 on the standard harness but still nothing. I removed a different aftermarket radio before installing this one, that also connected its blue power antenna wire (I think) to pin 14 and that had perfect reception. Are there any other switched lives I can attempt to connect pin14 to? Could I connect one of the pre-outs on the HU to pin14 instead? Am I understanding correctly that pin14 just needs to be supplied with 12v, which would ideally be only when ignition is on not to drain the battery? 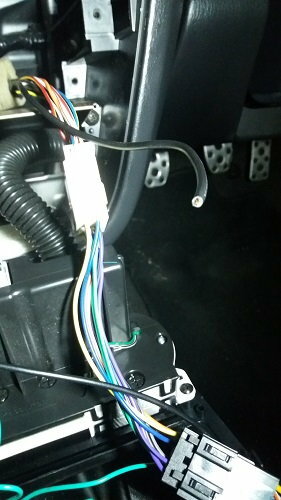 There's a thicker, black wire that is next to the standard head unit wiring that appears to be a Subaru OE wire that has been cut when the last HU was installed (in the picture). Any idea what this could be? Last edited by RetroPug; 07 February 2019 at 07:04 PM. Right. That's interesting, as the other head unit was fitted to a totally different aerial wire that is thinner and doesn't look original. but has a FAKRA connector. My next step is to get an adapter so it fits my aerial. Not sure if the aftermarket aerial cable was fitted because the original didn't work at all, or because they couldn't get it to work on the aftermarket Pioneer HU, or if it still goes to the OE aerial and bypasses bad wiring. The old HU had good reception through the aerial fitting that has been added later on though. We will see if I can get this booster to work with the added one. If not maybe I need to put a fitting back on the original aerial wire. I've managed to make it work, the cut wire is the aerial. It needs to work through the signal booster. The aerial wire off the signal booster is really thin though and it keeps breaking somewhere regardless of whether I crimp or solder it and then the reception disappears again. I might just buy a new one on ebay that has all the right plugs on and use that instead of messing around. Could anyone tell me which pin on the standard radio harness is a switched 12v live? ie. comes on with ignition? Thanks. Anyone able to confirm which is which? Don't have much time with the car at the moment. Radio Antenna Cable - Where does it disappear to..? !